I would like to thank everyone who has supported Kangaroo Court of Australia (KCA) this year which has helped it grow. Email followers have grown by about 12% although page views have gone down. The decrease in page views is not a big issue given last year was an election year so a spike then would be expected. KCA has been consistent in 2014 as far as writing numerous stories that are in the public interest that the mainstream media would not write. If you go back over the year there are many stories that have been driven by KCA and its supporters. I always like to publish the statistics so other sites/blogs can also learn from it. KCA’s influence is a lot greater than the page views that it receives. The true influence is the stories that KCA and its supporters drive that end up on other sites as well. KCA is now 4-years-old with the first post in January 2011. One of my favourite moments for the year is captured in the picture below of me attempting to interview Federal Court judge Bernard Murphy after he gave evidence at the Trade Union Royal Commission. 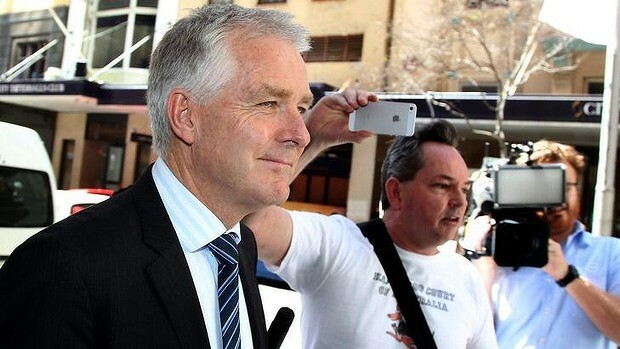 Mr Murphy is Julia Gillard’s old boss from the 1990’s when she worked at Slater and Gordon Lawyers. The picture was published by the Sydney Morning Herald (Click here to see) and I wrote about it and uploaded the video (Click here to read more). For me it showed that KCA was really starting to do one of the key things it was set up for which is getting people on camera and asking them the hard questions. For some of 2014 I spent working full-time on KCA which was the first time in its 4 year life. Previously I always worked on this site part-time. The full-time period was funded by supporters’ donations, supporters buying t-shirts etc. (thank you to those supporters) and from my own savings. My savings are running very low so I will be going back to work as soon as I find a job and continue to work on KCA part-time as I have previously done. At the current growth rate it will probably be a few years before I can permanently work on KCA full-time but things are always changing so it might be sooner with a bit of luck. When that happens it will make a huge difference and the experience of this year will help greatly. Some things were done well and some poorly but it was all good experience. There are a lot of stories to be investigated and written and a lot of issues to be driven. Time flies fast and by the end of 2015 the federal election will be only 6 to 12 months away which is one of the best times to try and put issues on the public agenda. A lot of the groundwork needs to done in 2015 and I will be doing the best I can to make sure things like judicial corruption and the associated political corruption is on the agenda. This website is independent and reliant on donations to keep publishing. If you would like to help it would be greatly appreciated if you would make a donation. Just click on the donation button below to donate via PayPal or go to the donation page (Click here) for other options such as mail and direct deposit. I will be back posting sometime in mid January so have a Merry Christmas and a Happy New Year. Have a Merry Christmas Shane, and a very pros prose New Year. May the Pennies fall into place and the puzzle of life become more clear. You have achieved what the main media wouldn’t touch. You have had a great year Shane in keeping many of us informed of things we just don’t read about in the media. I hope you have a happy christmas and a prosperous new year. I will be donating to your cause before xmas day when my age pension arrives. Thank you for your contributions to the debate of life-facts are such a rarity in this climate of journo’s seeking celebrity status ….rather than following their job description. This coming year will continue to deliver for you. Being an electronic Luddite can you explain what I am. A page viewer, an email follower or both. Wishing you all the best of peace, health and prosperity Shane, and may 2015 be kind to you, KCA and all who follow her. Thank you for a job well done. Thank you fro being fair dinkum in your reporting. Have a Merry Christmas and a Happy New Year to you! Keep well.keep laughing,and keep the real news rolling! Thanks for your posts and telling it how it really is. Thanks for your great reporting and hope you can keep these crooks on their toes. Have a great Christmas and New year. When I read your posts and compare it with the ABC fairy tales it gives me hope for the future, you can brighten my day with those three letters KCA.at least I know that there is some justice in the world and although they don’t all go to jail most of them are exposed to the public what thy are really like. Good work Shane A Very Merry Christmas and happy New Year to you and all yours. Allan from Myalup.WA. Hi Shane , wishing you all the best for Christmas.i know that my contribution to your “fighting fund ” was reasonably small , but if all your letter contributors did the same , you just may be able to do this on a permanent basis without the need to look for other work to subsidise your “fight ” for the public good. Hope to donate further in the new year. We need good people like you to keep us informed of all the corruption in this so-called democracy. Let’s keep all the ‘bastards ‘honest by giving to Shane’s fighting fund. Well done Shane, keep up the good work. Like the others have said, you had a great year, Shane. Please keep KCA going, its becoming a vital tool for information and to effect much needed change. Thanks for keeping us informed of the brimming corruption in the judicial system that the mainstream media just gets paid to well not to cover. Merry Christmas, mate. You really are a stirrer, then again, so was Christ with whip in hand dealing with the temple money changers. Your developing commentary site is a challenge to the msm journalists who need to lift their game for freedom. ‘You shalt know them by their deeds’. Keep up the Great work exposing those Disgraceful , Traitors , liars , Criminals , Fools and Thieves of the Injustice system . All the best Shane and thanks for “keeping the bastards honest” including the mainstream media. Looking forward to 2015. Shane, thank you for your great work. Have a Merry Christmas! Merry Xmas and a Happy New Year Shane. In the New Year I am hoping that the curse that has ridden me this year will be gone and I’ll be able to help out again with a donation or three. Many thanks & Merry Christmas Shane. Your information & efforts are priceless.